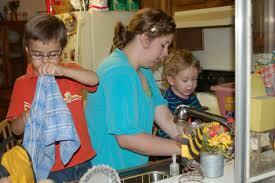 It is really important to teach our children some light household chores. We may assign them to some specific tasks according to their capacity to handle it. Like for 5 to 7 years old, they can already sweep the floor, arrange her bed, clean the room, hang up her towel, feed the pets, set the table and even help in clearing the dishes after a meal. And as they grow, like age 8 to 10 years they can be assign to a more bigger task like unloading the groceries from the bag, do laundry, help prepare foods for a certain meal or snacks, brushing the bathroom and prepare her own breakfast, lunch and snacks into a container. As a general rule, these kids must be supervised and be guided so they can perform it well. Try also to accompany them during shopping for groceries, as this can be an opportunity to teach them about making healthy food choices and also you can teach them about budgeting. By training them at an early age, they will grow up responsible and will be able to value the worth of every task they accomplished. 1. Kids wants to help. Sometimes when kids saw you working on something and wanted to help you, take advantage of her desire and encourage her excitement about doing kid chores. 2. When she says she’s bored. This happen very often it’s because young kids have a short attention span, or she could be having problem in doing the task or she doesn’t like to do the task. You could ask her to do the task with you or let her do something else. 3. Make chores more fun. It can be done by switching on dance music while sweeping the floor, dusting the sofa, windows and dividers in order for them to get motivated and will not feel tired. 4. Praise her a lot. At first, she performed with mess but as she go through for a long time she will be able to do it right, don’t forget to praise her achievements. By taking the time to teach you kid gets into the habit of helping around the house, you’re setting her the pattern that will benefit you as a parent and your kids as they grow up.